Thanks for the call last week checking on the delivery and operation of our Loop Plus banding machine. All is well here. After uncrating the machine, we followed the directions of the sales support staff and in no time the Loop Plus was up and banding various packages for practice. After a little practice we were banding products for delivery to our customers. You may ask yourself, why is an embroidery company purchasing a Loop Plus banding? E-Z Stitches is a commercial embroiderer of numerous garments, including martial arts products-specifically karate belts. The Loop Plus provides a secure band around a difficult product, and ultimately delivers a quality image to our customers. The variable strap length is a great feature for our product banding requirements. Truly, the Loop Plus is versatile, very mobile (we have it on a wheeled cart) to move to other shop locations and durable. All in all, an economical and valued addition to our company’s output processes.  The Wexler Company has delivered on time, and with great support. I appreciate your dedication to E-Z Stitches. You have made this acquisition very E-Z. Your product knowledge was superior and I didn’t rely on the proverbial telephone tag, “I’ll get back to you.” You are a great asset to your company. I am please to provide this testimonial for Wexler, yourself and your products. Thank you.